Full review: Is this compact pocket-cam a Flip killer? The pocket-camcorder market is a crowded at the moment, which is a good thing for consumers as manufacturers are constantly trying to outdo each other with better features and improved functionality. The Panasonic HM-TA1 joins the likes of the Sony Bloggie PM5 and Flip Mino HD bringing 1080p shooting on a budget, offering Full HD picture quality in a decent palm-friendly design. The HM-TA1 fits in the hand well, feeling a little bit bulkier than your average smartphone and weighs in at just 114g with battery. A small, flush button on the right-hand side of the camera turns the thing on, starting up the small 2-inch (a ho-hum 153,600 dots) monitor. The controls on the back are simple but effective. The record button resides just underneath the LCD which is flanked by the options to playback footage and switch to camera mode. Underneath is a menu button to drill into the modest extra functionality and either side this is the light and trash buttons. 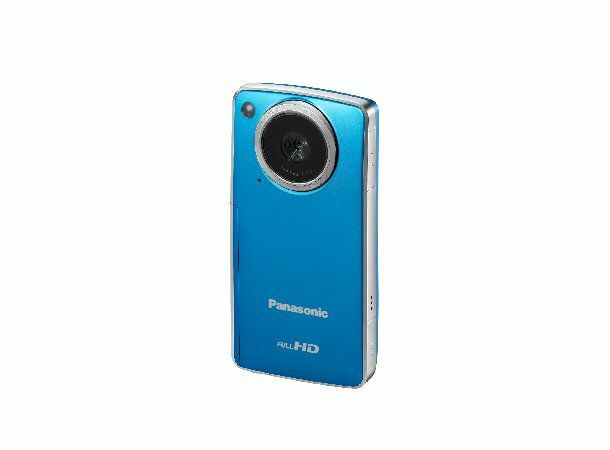 One of the main draws for image enthusiasts to the Panasonic HM-TA1 is its ability to shoot Full HD 192x1080p footage. This is superb in a camera this size and in our tests the images were as crisp as you have come to expect from HD. But the camera's limited features do mean that images don't quite sparkle as much as they should – this may have something to do with the modest 4.1mm CMOS sensor and that images are limited to 30fps. Luckily there are basic features on-board to give you more than passable footage, including electronic image stabilisation and an LED light that seems to be brighter than the sun. Okay, it's 1400 Lux but it illuminated night scenes nicely in our tests. A 4x digital zoom, 8MP stills shooting and the ability to use the camera as a webcam round off the HM-TA1's extra functionality. When it comes to build quality, the cam doesn't impress as much as it should. This is all down to the plasticky compartments that hide the connections. Slide down the cover for the SD card and battery (bonus points for making the battery removable) and the cover clings on with a rubber hinge. The same goes for the hood that hides the extendable USB stick. While it's great that this is a plug-and-play device, having to lift off another plasticky lid, then slide the USB out is fiddly and hard to do if you are lacking fingernails. Niggles aside, the big redeeming factor is that alongside mp4, you can shoot in iFrame mode, which lets Mac users edit footage in iMovie. Couple this with the addition of basic editing software and you'll be uploading your stuff to YouTube and editing in no time. Available in black, blue, purple and white, it may lack the build quality of brushed metal Flip Mino HD or the sports capability of the Kodak PlaySport but for a budget-friendly £130, the Panasonic HM-TA1 is still a solid addition to the pocket camcorder market.